In restaurants serving "à l'assiette", wich means that your dish is presented already served on a plate, it's very important for the plates to be hot, otherwise dishes arrive cold and it's the customer that (rightly) becomes heated. At home it's worth doing the same thing: you are sure to serve hot dishes to your guests, and as a hot plate can wait longer than a cold one, it can sometimes help to avoid panic in the kitchen at serving time. 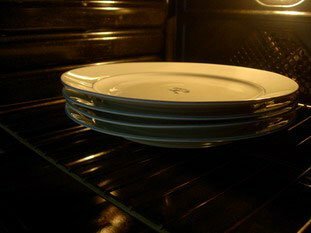 Here are some simple ways to heat your plates.